He made many good points, but it was also evident he was not reading my books. If he had, he would know that I agree with him. But, I also needed to point out that his unfamiliarly with my writings has led to some false assumptions on his behalf. Let me share my response. Some churches don’t need multiple generations, especially in areas which are growing with one primary cultural generation. And, I list such examples in the book. Also, I agree that if a church is performance driven it is not an organism, but a mechanization (see what I said about professionalism verses improvisation in “Inside the Organic Church”). But, for a church to reach the unchurched, who are not yet ready for “true connectivity/mutuality/UNITY” we must offer entry level (i.e. evangelistic) conduits that are individualized based upon cultures. But, for people to mature in Christ, we must have processes to bring them into unity, connectiveness, and mutuality. Thus, individuality in cultural aesthetics is for evangelism. And creating “one out of many” (see my writings on this in Preparing for Change Reaction) is the second part of a two part process. Both are needed, and a church fails without both. Commentary by Dr. Whitesel: Holacracy explains the long-term cohesiveness created by emphasizing small teams or small groups within an organization. But this article also explains why diversity (silos) and cohesiveness (silos remaining under one organizational umbrella) creates a healthier organization. Read this important article on the organizational behavior of holacracy with diversity amid unity. by Greg Satell, Harvard Business Review, AUGUST 28, 2015. When Alfred Sloan conceived the modern corporation at General Motors, he based it on hierarchical military organizations. Companies were split into divisions, each with their own leadership. Authority flowed downwards and your rank determined your responsibility. Today, a few organizations – like Medium, David Allen Consultants, and Zappos – are adopting a radically different, approach to management: holacracy. Even as someone who has studied alternative management movements, I’ve been skeptical about holacracy, which eschews the standard “org chart” for a system of interlocking “circles.” To understand it better, I recently sat down with Brian Robertson, author of the new book Holacracy, to figure out how he’s gotten hundreds of firms to sign on. How do you balance cohesion and diversity? It’s become fashionable in management circles to talk about “breaking down silos” in order to improve how information flows around the enterprise. Yet we need silos, which are cohesive units that are optimized for specific tasks. What’s more, the reorganization efforts that are supposed to break down silos invariably recreate them in different places. What’s really important is to balance cohesion and diversity. Without cohesion, there is no common purpose, but without diversity groupthink will set in and eventually that purpose will lose relevance. So you need a healthy amount of both in order to be able to both operate efficiently and adapt to new information in the marketplace. Today in an increasingly skeptical world, the church must move beyond branding and build a new, more powerful reputation. Here are 5 steps to elevating your visibility in a community. 1. Elevate the visibility of your need-meeting. Churches should be known as the place in a community where people go when they have a crisis. Churches that offer divorce recovery programs, grief support groups, 12-step programs, etc. increase their visibility as the primary place where needs are met in their community. 2. Elevate the visibility of spiritual-change. People are looking for ways to change their lives and often psychologists or self-help programs are their first choice. While these can offer the physical change that people need, I believe only Christ can offer the spiritual change that people long for deep inside. So in the name of helping people better their physical lives, do not neglect their higher needs for a supernatural transformation that only comes through Christ. 3. 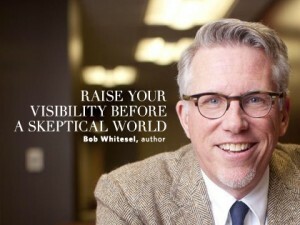 Elevate the visibility of your openness and honesty. Churches often promote that they have the best program or the most exciting worship. But non-churchgoers sense that this is not the real purpose of the church. Acknowledge that your church doesn’t do everything well and sometimes you get fixated on your organizational needs. Then remind them that your church is a spiritual community, seeking to work together to draw closer to Christ. 4. Elevate the visibility of your unity in diversity. In an increasingly diverse world, people want to go to a church that mirror’s the diversity of God’s creation. But such diversity must not be only symbolic, but also heartfelt. It is important for people of diverse cultures to run the church together, to worship together and to learn from one another about cultural background and baggage. The church should be visible in the community as a place that not only promotes spiritual reconciliation to God, but also physical reconciliation between cultures. 5. Elevate your visibility as a place to learn. People today have a conceptions of the church as a place that lectures and criticizes, rather than a place that promotes learning. Jesus gave us a Great Commission (Matt. 28:18-20) to “make learners.” Thus our goal must be to acquaint them with His words, while we exemplify how these words are lived out in community. 6. Elevate your visibility as a place where everybody can find a place to fit. Emphasize smaller fellowship groupings within the larger whole. Most people today are not only looking for a large event, but also a smaller group where they can ask spiritual questions and receive support on their spiritual journey. 7. Elevate your visibility as a community that promotes and seeks God’s wisdom. The church should be known as a place of Bible-study and prayer. Thus it should be a place where people who are estranged from God or even just struggling in their relationship, will find people and prayer environments that will assist them in connecting to their heavenly Father. If a person in the community needs prayer, the first place they should think of is your church. If you can’t elevate one or more of these areas, because they don’t yet exist in your church, then start with the easiest but don’t stop until you develop these seven ways to elevate an organically spiritual and Biblical visibility. Adding a new worship encounter has its caveats. After helping churches for 20+ years add new worship services, below is my “short list” that I use to help clients see the basic “7-steps” of launching a new worship encounter. GOAL 1: The first goal is the Great Commission to “make disciples” (Matthew 28:19). Thus, getting new attendees into small groups where they can grow along with others is the major objective. This is even more important than adding a new service. So, if you can’t undertake a new service, than at least add more small discipleship groups. GOAL 2: The second goal of a new worship service is to create a culturally relevant worship encounter. It is not a performance, nor a time to create mini-celebrities. It is a time to foster an encounter with God. Everything should revolve around these two goals. If it does, then go onto this short list of things you must do to create a new worship encounter for an existing church. 1. The people who design a new worship encounter should demonstrate that they are missionaries to that culture, or that they are from the culture you are reaching out to. 2. Ensure you can financially sustain a new service for 18 months, before you launch it. 3. Make sure you have duplicate leadership too (start training them now, telling them that soon we will launch a new service and they will lead it). 4. Pick a venue that will be at around 35% full with your projected attendance. 5. Start small groups (Sunday Schools, Life Groups, etc.) of the culture you are reaching out to, three months before you launch your worship encounters. Ensure that these small groups are between 5 and 8 people (i.e. they have room to grow) and that they know they are the new discipleship venues for new people who attend the worship encounter. 7. Also, make sure your overall attendance is at least 100 before you start a new service. • At the end of that time, they must either recruit someone to take their place, or re-up for another year. The idea is to create the minimum number of attendees necessary for worship to break out in a larger gathering: usually 35+ people. • Thus, with 50 committed, you will usually have 35 in attendance and your new service can grow. Churches have absorbed immigrants from the fast-growing, youthful Christian populations of Latin America, Africa and Asia, and synagogues have received Jewish refugees from the former Soviet Union. Congregations serve as both spiritual filling stations and all-purpose social networks for those seeking referrals for jobs and human services or just the experience of familiar languages and foods. “This is my spiritual home, also my home away from home,” said Jane Chan of Pittsburgh Chinese Church in McCandless, where the Bethel Park resident has been a longtime member and volunteer. The independent Protestant church, with roots in 1930s Chinatown, has weekly services and classes in English, Mandarin and Cantonese, followed by a communal meal. At a historic St. Stanislaus Kostka Church in the Strip District, amid displays of Polish icons and prayer cards reflecting its immigrant founders, a bride and groom pray at a side altar to the Virgin Mary after a bilingual wedding — in English and Vietnamese. In a carpeted former Presbyterian sanctuary in downtown Carnegie, rows of Muslims from many nationalities kneel and prostrate amid Arabic prayers at a Friday service. At a makeshift temple in the storage room of a Carrick grocery store, refugee priests from Bhutan chant in Sanskrit and prepare a small fire offering in honor of the Hindu goddess Durga. At a modest Greenfield storefront, a dozen mostly American-born participants recite an ancient Buddhist chant, sit silently on meditation cushions and hear a teaching from a Tibetan lama. Fast Facts: The Orchard Evangelical Free Church was founded in 1953 and has been growing ever since. It is now one congregation worshiping in four communities in the greater Chicagoland area; each of which stays true to the Gospel-centered mission while also tailoring their ministries to their unique congregations. The Orchard – Arlington Heights Campus would like specific prayer as they build teams to invite everyone who lives and works in Arlington Heights to our church. Pray that the Lord would raise up gifted and passionate leaders to bring Gospel-engagement to every neighborhood, school and people group. Pray that the Holy Spirit would soften the hearts of their neighbors, friends and family members and open their eyes to their need for a Savior.